"In the Happo-En Garden, Tokyo" by Linda Pastan was offered by Poets.org's Poem-A-Day on February 25, 2014. A link to the poem, including the poet's notes as well as links to other poems by the same poet, may be found here: http://www.poets.org/viewmedia.php/prmMID/23889. Linda Pastan (b. 1932) was the Poet Laureate of Maryland from 1991 - 1995, and served as a staff member for the Breadloaf Writers Conference for two decades. Additional awards of which she was the recipient include a Pushcart Prize, and a Dylan Thomas Award. She is the author of many published books of poetry. More biographical information may be found here: http://www.poets.org/poet.php/prmPID/749?utm_source=PAD%3A+In+the+Happo-En+Garden%2C+Tokyo+by+Linda+Pastan&utm_campaign=poemaday_022514&utm_medium=email. The title refers to the Happo-En Garden (pictured) of Tokyo, Japan. Happo-En means "garden of eight views." The poet reveals in her notes that when she visited this garden, the myth of Eden and Eve immediately came to mind, and she was inspired to write the poem. 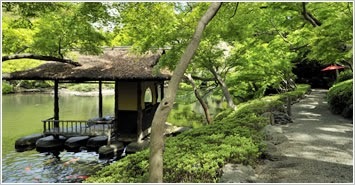 Additional information about the Happo-En Garden may be found here: http://www.happo-en.com/english/garden/. The poem is presented in five quatrains of irregular free verse. A Japanese version of the myth of Eve in Eden is told. The clear images and precise, sparring word choices are evocative of short Japanese form poetry.